Lori Riggins Photography: Common household object, at least in my house! 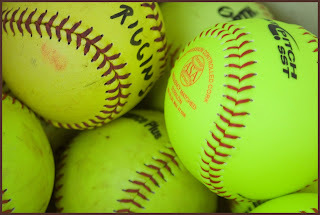 A bucket of softballs or baseballs sitting around is pretty commonplace at my house this time of year. I'm always tripping over one near the door or in the kids' rooms! I had a hard time finding a good focal point in this shot - where should the focus have been? Settings were RAW, AV mode, f/5.6, ss 1/320, 28-90 lens, ISO 400. CC Please! This is a followup from yesterday's post, someone (I think it was Becks) suggested I run Urban Acid on this shot. I used Jess's Urban Acid Action for PSE (thanks Jess!). What do you think? We don't do baseball at our house, but I love it all the same. I did a bunch of volleyballs for a pic during sports week. It was tough finding the right focus point. In this one, it seems like it should be the ball on top--maybe the one to the right? Not sure. Nice shot, though! As for your dd, the acid is perfect for this shot. It really adds to it!! Well done. I like the Urban Acid effect on that photo. It pops it a bit! I'm with Jan on the focus spots too - one of the top two balls!Looks fine though! I think the focus is fine, great shot of the baseballs. The Urban Acid look very nice, makes it pop. I like the urban acid on that shot. Looks great!